See how the lilies of the field grow. “Listen to the words of the wise and take all that is good as your own. With this as a base open your own door to the truth. My message is simple - YOU’RE BORN AN ORIGINAL WARRIOR. DON’T DIE A COPY! Albert Einstein once said,”Great spirits (people) have always encountered violent opposition from mediocre minds”. There is much truth about it. Mediocrity is a religion bounded on the north by compromise, on the south by indecision, on the east by past thinking (conservatism), and on the west by a lack of vision.Every person has been endowed with a certain mixture of abilities and opportunities, which makes him unique. There is something that God has placed within each of us that causes us to cry out to be above average and extraordinary. In the last 12-14 years I’ve been a member and active minister in a few different churches and denominations both in Europe and America. It was for me a good and also very challenging time: the time to learn humility while growing towards understanding of my true uniqueness, gifts and talents. As a martial artist I had to embrace this particular lesson because to be honest there are not many martial artists who really follow this principle. Interestingly, in martial arts there is sometimes a strong even blind tendency to follow a particular Sensei’s teaching/behavior and the techniques he performs. That’s why the style becomes more important than individual development. What really saddens me is that almost each of these churches and martial arts clubs/dojos had one thing in common – to bring all members to the point of grey mediocrity. I want to stress my belief that every human being is endowed with creativity and has the potential to progress through any number of stages. The choice however is always ours. There is really no need to copy the old ways. As Sensei Shoji Nishio (8th Dan Aikido & Iaido, 7th Dan Karate, and 6th Dan Judo) one of my great teachers rightly pointed out: “Do not just copy the old “Japanese way”. If you are independent, you can develop your specific nature, and that is very, very important… I think that people should be very aware of it”. We should respect old ways and learn from them as much as possible; however to become a new wineskin (Matt.9.17) is more important than maintaining the conservative status-quo. I think also that compassionate approach/attitude, not rebellious act, will be justified and blessed in any endeavor. Why am I living like this? Why am I a member of this church? Where have I restricted myself? Why do I follow this particular teaching/philosophy or man? Where do I need radical changes? Why do I have toast and coffee for breakfast every day? Why am I not exercising? Maybe should I change a diet? Why am I playing computer games? How can I spend more time with my family? Why do I always go to the same restaurant? What talents/gifts in my life have I been neglecting? Why am I sabotaging myself in this area of my conduct? What a good habit, if adopted and practiced every day, would revolutionize my life? Why I allow this person to treat me this way? I wonder what would happen if I stopped watching television? It is essential not to censor yourself no matter how im¬practical or outrageous the question or answer sounds. This allows for fresh unanticipated insights to reveal the truth about themselves. If you're honest and open with yourself and diligently ask ques¬tions about every area of your life, you'll probably discover that some of these questions reveal blind spots and assump¬tions that deserve to be challenged. Others will open up needs and desires you've repressed. In some areas, people like animals are creatures of habit. We easily fall into routines that may have once served us well but now may be holding us back and keeping us in a rut. Our future depends directly upon how well we question and examine our beliefs, actions, values, goals and ways of liv¬ing. Asking the right questions is crucial for a creative life. If we want fresh perspectives and new insights, then asking penetrating and challenging questions of ourselves, and listening non-judgmentally to the answers, will reveal untold creative opportu¬nities for change. In the Book of Genesis, God asked Adam, “Where are you?” He is still asking that question of each of us today. Where are we in regard to God’s plan for our lives? Where are we concerning the gifts and talents He has given us? Don’t ever let your quest for balance and security become an excuse for not taking the unique, radical, initiative move that God has directed you to take. Many times the attempt to maintain balance in life is really just an excuse for being lukewarm. In the Bible, the LORD says three times to Yehoshuah (Joshua), “Be strong and courageous”. Today, He is saying the same thing to all believers.Therefore, never try to defend your present situation and position. Choose to be a person whose attitude is on the offensive, not defensive. People who live defensively never rise above being average. We’re called to be on the offensive, to take action/initiative in the daily challenges of life. A lukewarm, indecisive person is never secure regardless of his wealth, education, or position. Please, for a moment think about it. When you choose to be on the offensive, the atmosphere of your situation will begin to change. Slowly, but it will begin. So if you don’t like the atmosphere of your life, choose to take the offensive position. Taking the offensive is always a decision made within. When you choose to be on the offensive, keep all your conflicts personal. Fight the issue, not the person! Speak about what God can do in you and through you, never what others cannot do. Such an attitude will give you - Peace. Sooner or later you will find out that when all of your reasons are defensive, your cause almost never succeeds. Just as in the darkness the warrior needs to be able instantly draw his flashing sword, so too here a positive and dynamic action is the answer. Being on the offensive and taking the initiative is a master key that opens the door to many opportunities in your life. Learn to create a habit of taking the initiative and don’t ever start your day neutral. Every morning when your feet hit the floor, you should be thinking on the offensive, reacting like a samurai, a conqueror-warrior, taking control of your day and your life. Remember the old saying; God helps those who help themselves. Waiting for God to change your life, to write out a schedule of what you need to do, is not biblical. Sometimes religious people act that way and that’s why they do not grow, instead they only become more religious. By pulling back and being defensive you usually end up making the problem worse. Intimidation always precedes defeat. 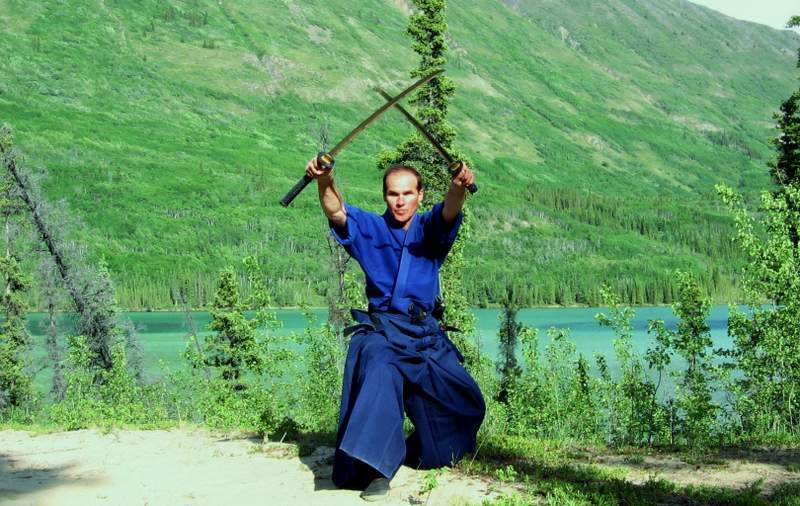 I think the martial techniques in Yeshua-Do can give us a different perspective and teach a different approach to life’s challenges. Both sword (ken), staff (jo) and hands/body (Tai-jutsu) techniques explain how to face an opponent fearlessly and to enter (Irimi-issoku)) in a moment of attack into his “dead angle”, where you can peacefully and effectively be in charge of his fate. Thus, the principle of Irimi means also that you have victoriously moved your body into a strategic position towards your opponent and he is unable to counter-attack; here you‘ve already won. Well, if you are not sure which way to go, pray and move towards the situation in confident trust. But, be like the wise fishermen who got trapped in a storm in the middle of the lake. His companion turned to him and asked, “Should we pray, or should we row?” And he responded saying, “Let’s do both!” That’s taking the offensive. We, Yeshua-Do-ists, need to be known as people of persistence and endurance. This always reminds me the words of great English explorer, Ernest Shackleton who used to say in the midst of his life’s challenges, “By endurance we conquer”. One person with commitment, persistence, and endurance will accomplish more than a thousand people with interest alone. Persistence is a habit; so is quitting. In the Far East the people plant a tree called the Chinese bamboo. During the first four years they water and fertilize the plant with seemingly little or no results. Then the fifth year they again apply water and fertilizer – and in five weeks’ time the tree grows ninety feet in height! The obvious question is: did the Chinese bamboo tree grow ninety feet in five weeks, or did it grow ninety feet in five years? The answer is: it grew ninety feet in five years. Because if at any time during those five years the people had stopped watering and fertilizing the tree, it would have died. Dear friend, you should never worry how much money, ability, or equipment you are starting with. Just begin with a million dollars worth of determination. Remember: it’s not what you have; it’s what you do with what you have that makes all the difference. Someone has said,”If the only tool you have is a hammer, you tend to treat everything like a nail”. Never underestimate the power of the gifts that are within you. Gifts and talents are given us to use not only so that we can fulfill to the fullest we call in our own live, but also so we can reach the souls who are attached to those gifts. Martin Luther once said, “Every man must do two things alone, he must do his own believing and his own dying”. When you compare yourself with others, you can become bitter and confused for there will always be someone greater or worse than you. Such comparisons are a sure path to frustration. What a waste of energy, time and effort when you compare your place and plan with other people. Every person who trims himself to suit everybody’s expectations will soon find himself whittled away. The Bible says, “Why do you pretend to be another?” You are only supposed to compare yourself, your place, your life and plan with God’s will. Unfortunately, because of frustration most people let others control their destiny. But you - dare to be what you are. Resolve to be yourself. Don’t allow anyone to take over the driver’s seat in your life, fulfill your own dreams and determine your own life’s course. You must create your own system and your own plan, or another man’s will enslave you… Success in someone else’s life does not hurt the chances for success in yours. In reality, success really is simply a matter of doing what you do best and not worrying about what other person is going to do. Truly, we carry success or failure within ourselves. It does not depend on outside conditions. The significance of any person is determined by the cause for which he lives and the price he is willing to pay. What you set your heart on will determine how you spend your life (Matt. 6.21). When you are an original/unique (and you are) and walk in God’s plan, you shine like a star in the firmament. Copies are like darkness in which they float. But you were created for achievement and conquest. You have been given the seeds for greatness. You are a new creation in Christ; yes, the old has gone the new has come! (2 Cor.5.17). So you are not a refurbished sinner. You are “uniquely and wonderfully made” (Ps.139.13-16), and God Himself calls you a friend (John 15.15). What more could you want? Your life now makes all the difference. Rise above being average and don’t die a copy! Draw your sword and be ready to cut through mediocrity!